Olympia’s current mayor Cheryl Selby is the third woman to hold the office of mayor of Washington’s capital city. Holly Gadbaw was the second. The honor of being the first belongs to Amanda Benek Smith. Serving in office from 1953 to 1960, she lived in an era of sexism and a time of rapid change for Olympia. A spirited reformer, Smith brought a program of openness that many welcomed as a change to city government. Amanda Marie was born on December 7, 1906, in Verdun, France, to Leon and Anna (Alexandrier) Benek. The family immigrated to the United States when Amanda was 11-months-old, settling in Lawton, North Dakota. After high school graduation, she relocated with her family to Olympia due to her father’s ill health. Amanda graduated from the Dietz Business College in Olympia and began work at the Thurston County Courthouse. The Olympia Credit Bureau soon hired Amanda and she was made manager a year later. In 1931, Amanda married Charles Rochon Smith. Three years later, the couple bought the Olympia Credit Bureau and co-managed it until Charles’ death in 1964. The couple had one son, Terry Rochon Smith. Amanda became active in civic and community affairs. She participated in many groups such as the Parent-Teacher Association, First Christian Church, Red Cross, Cub Scouts, Cancer Fund, and Community Chest. She even founded the Kiwanis Auxiliary for women, at the request of the Kiwanis. The Kiwanis now have no gender restrictions. Amanda Smith first became interested in politics after becoming disgusted with the discarded alcohol bottles thrown into her mother’s backyard on East Bay Drive from a nearby collection of shacks that harbored illegal activity. The city government had turned a blind eye to the problem and though someone suggested she run for mayor herself, Smith campaigned for a male candidate who promised action. After six months of inaction, she threatened to have media coverage of the issue at the next city council meeting. The following day, the city boarded up the shacks. Encouraged and with the strong support of her family, Smith decided to run for mayor. Reminiscing in later years, she remembered that a group of business and professional men had offered her a $2,000 bribe if she would not run for office. She refused and campaigned door to door, also giving speeches to labor unions, the PTA and Ministerial Association. 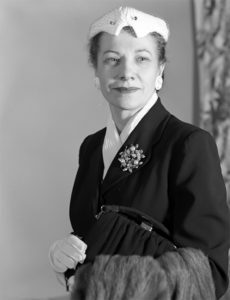 Although local newspapers often discussed her in sexist terms, commenting on her fashion sense and home life, Smith knew how to cultivate the housewife image to her advantage, and even had published an article in the Good Cooks section of the Daily Olympian on October 19, 1952, highlighting her mother’s French recipes and some of her own (including tomato soup cake). In the end, Smith defeated her opponent, former mayor and businessman Ernest Mallory, in the March 1953 elections. The final vote was 3,182 to 2,477. At the time, a commission rather than a council ran Olympia. Mayor Smith was in charge of law enforcement, sanitation and the fire department. The two other commissioners were in charge of finance and public works. Smith described her first term as the hardest, but won reelection in 1956 with 3,812 votes to F. W. Mathias’ 2,392. Her term expired in 1960. A very active mayor, Smith helped with many reforms in Olympia. This included moving the garbage dump from State Avenue to outside city limits on the Westside. She also reorganized the police department and had the jail fixed up. She had it painted flamingo rose, emerald green and camellia pink. In addition, she replaced the jail’s pornographic magazines with Reader’s Digest. Smith tried to be a good influence, bringing prisoners candy bars every Friday and even food to a female prisoner after Smith deemed jail food inadequate. She also worked for new streetlights along Capitol Way and the Westside hill. 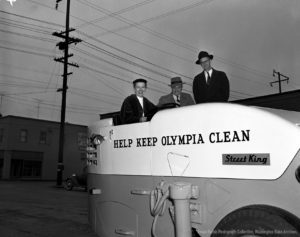 Smith wrote a weekly column in the Olympia News newspaper (titled “Mayor Smith says”) with civic advice, such as to regularly wash out trash cans to make life easier for trash collectors. She even banned punch tab machines from downtown, believing it unethical for the city to make money from gambling. She helped begin the Golden Age Club for seniors. In later years, she was very active in the Olympia Senior Center. 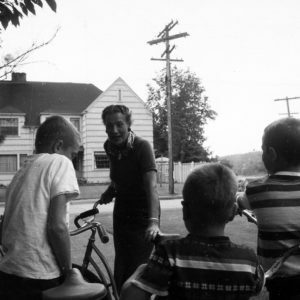 After leaving office in 1960, Smith remained involved in the community. She lost a bid for mayor in 1969. In 1983, a section of Fifth Avenue between Capitol Way and Columbia Street was renamed Amanda Smith Way and in December 1988 she was honored by being included in the “Twelve Who Counted: Centennial Profiles” special section of The Olympian. Smith passed away at Panorama City on March 13, 1996. Note: The author wishes to thank Benjamin Helle, Washington State Archives, for assistance with this article.